According to the report by the International Society of Aesthetic Plastic Surgery, more than 360,000 procedures were carried out in 2010. 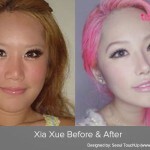 Among which, getting liposuction, blepharoplasty, double eyelid surgery and rhinoplasty in Korea were the most common. In 2014, the latest plastic surgery statistics also show that on top of all that, hair and skin treatments are also frequently done in Korea. The more invasive form of surgery, facial contouring still the most mysterious of Asian procedures to non-Asian folk. Compared to the West, there are countless media reports on facial contouring that have been done in Korea. Whether it may be a report on a grotesque post-surgery result born from obsession or exaggerated claims bordering on racism, rhinoplasty can be a means to an end of achieving facial balance and beauty, when it is done right. Symmetry is attractive to the human eye, and so is neotenous features. These two factors, when combined together, align with what is now the beauty trend in Asia. For anyone looking to venture into the world of cosmetic surgery, depending on where you go, the top nations may just be your safest bet.